It looks like Gavin Schmidt might be jumping from the sinking ship now as well. To me, Gavin looks like he’s positioning himself for a back-down on his AGW position – why would he point out the flaws with Nuccitelli’s post otherwise, it’s no concern to him? I think Hansen, even though he admitted the lack of a temp rise over the last 16 years, was given the boot from NASA (or shall we say, given the opportunity to retire to pursue his hobbies) because he refused to change his stance on AGW in the face of very strong evidence that he’s wrong. Schmidt on the other hand can keep his NASA position if he backs down and follows where the empirical evidence leads him, regardless of whether it proves his previous beliefs incorrect. If he doesn’t back down at some stage he’s going to look a fool and his career is going to go down the toilet. I think he’s laying the foundation for a back-down in the future and attacking the propaganda from those who support his current position (i.e., SkS) is the first step. Does he have a choice other than recanting in the near future? I don’t think so. This post was spotted on Climate Depot. I suspect some of them have been positioning themselves to back out of the badly flawed, Unproven theory, for a few years now. Others, however, are not only clinging bitterly, but are going beyond the pale in trying to scare the public. I say, let them keep exaggerating! Recent peer-reviewed research continues to DROP the upper limits of climate sensitivity. The ship is Sinking. Lysenko was a non-scientist whose far-fetched ideas contradicted genetic theory that was well understood at the time. Lysenko is an better analogy for the skeptic rather than mainstream scientific opinion. Lysenko was a government sponsored junk scientist whose theories resulted in the deaths of millions of people. Sceptics do not wish to kill people, unlike the ecofacists who promote junk global warming science. If Hansen was fired or forced to resign, why hasn’t the same happened to Kevin Trenberth? Seems Steven Joyce’s great New Zealand Science Challenge will inevitably have a climate change component and Jim Sallinger seems to be in the mix. Interesting though that there seems to have been a specific objective declared. This sounds like the Government saying – forget the hyperbole, give us something useful. It also says that previous projections where not too good. The alarmists are going to have to work very hard when restricted to these time frames. Salinger gets his book plug in too; I’m sure it will be a best seller. Scientists at the U.S. government’s Earth Systems Research laboratory in Hawaii reported Monday that the concentration of carbon dioxide could pass 400 parts per million for the first time in the next few days. These warnings, however, come amid reports that global temperatures have been leveling for the past fifteen years. Climate scientists have also been lowering their warming projections since the UN’s 2007 estimate. “Forecasts for the 21st century that were made in the late 1990s had better be revised downward because it’s very clear that we are going to go pretty close to a quarter of a century, at least, without a warming trend,” said Pat Michaels, director of the Center for the Study of Science at the Cato Institute. A new paper published in the Journal of Geophysical Research – Atmospheres finds the latest generation of IPCC climate models were unable to reproduce the global dimming of sunshine from the ~ 1950s-1980s, followed by global brightening of sunshine during the 1990’s. These global dimming and brightening periods explain the observed changes in global temperature over the past 50-60 years far better than the slow steady rise in CO2 levels. The authors find the models underestimated dimming by 80-85% in comparison to observations, underestimated brightening in China and Japan as well, and that “no individual model performs particularly well for all four regions” studied. Dimming was underestimated in some regions by up to 7 Wm-2 per decade, which by way of comparison is 25 times greater than the alleged CO2 forcing of about 0.28 Wm-2 per decade. The paper demonstrates climate models are unable to reproduce the known climate change of the past, much less the future, that the forcing from changes in solar radiation at the Earth surface is still far from being understood and dwarfs any alleged effect of increased CO2. The point here is that until all of the significant feedback effects have been identified and quantified, negative as well as positive, all estimates of the effect of increasing CO2 in the atmosphere are simply bogus. The fact that the alarmists’ models utterly fail to predict actual temperatures proves that they do not adequately take a great many feedback effects into account. STEVE adds: There’s one seemingly small detail in this story that is likely to be missed by the mainstream media, etc: the role of IIASA in this study. IIASA is no fringe research group that can be marginalized by Al Gore; to the contrary, it has been at the center of much of the “consensus” climate science world. Among other things, IIASA produces the emissions forecasts used by the UN’s IPCC and most of the climate modelers. The fact that IIASA has joined this “skeptic” finding is yet another sign that the whole climate horror show is falling apart. Lüdecke, Hempelmann, and Weiss found that the temperature variation can be explained with six superimposed natural cycles. With only six cycles they can closely recreate the 240 year central European thermometer record. There is little “non-cyclical” signal left, suggesting that CO2 has a minor or insignificant effect. The three German scientists used Fourier analysis to pick out the dominant cycles of one of the longest temperature records we have. The Central European temperature is an average of records from Prague, Vienna, Hohenpeissenberg, Kremsmünster, Paris, and Munich. The dominant cycle appears to be about 250 years. There is also a cycle of about 60 years, corresponding to the Atlantic/Pacific decadal oscillations. Data is of course, always the biggest problem. If we had 10,000 years of high quality global records, we could solve “the climate” within months. Instead, we have short records, and Lüdecke et al, make the most of what we have. 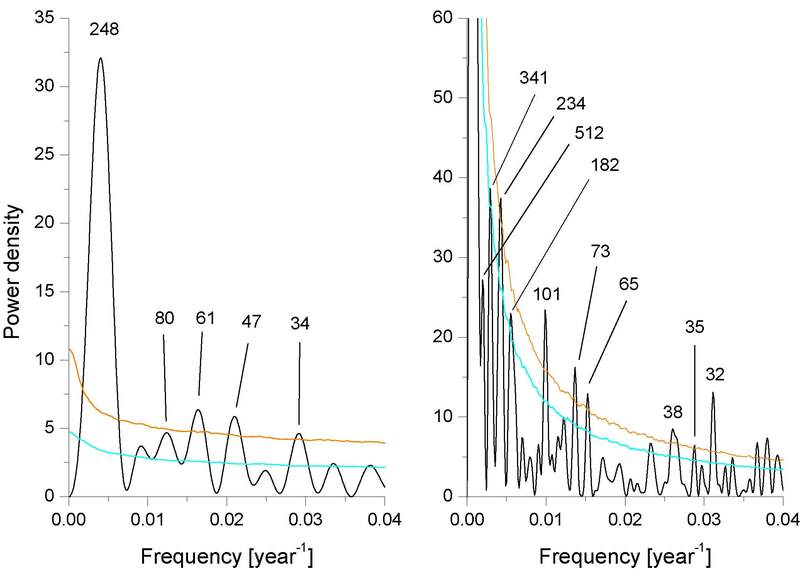 The European records are only 240 years long, or (darn) one dominant cycle, and only one region, so to check that the results are valid over longer periods they also analyze a the 2000 year Spannagel Cave stalagmites proxy, where the dominant cycle of roughly 250 years is confirmed. To show that the results apply to other parts of the world, they look at the German Alfred Wegener Institut (AWI), Antarctica series. Fourier analysis can’t tell us what causes the cycles, but it can tell us the likely frequency, amplitude and phase of those cycles. If these are accurate, it can be used to rule out significant effects from man-made forces and ultimately to predict what will happen next. Fig. 1: Left panel: DFT of the average from 6 central European instrumental time series. Right panel: same for an interpolated time series of a stalagmite from the Austrian Alps. Fig 2: 15 year running average from 6 central European instrumental time series (black). Reconstruction with the 6 strongest Fourier components (red). […] Thus the overall temperature development since 1780 is part of periodic temperature dynamics prevailing already for 2000 years. This applies in particular to the temperature rise since 1880, which is officially claimed as proof of global warming due to CO2, but clearly results from the 250 year cycle. The 250 year cycle was driving the temperature drop from 1800 to 1880 (see Fig. 4), which in all official statements is tacitly swept under the carpet. This same general fall and rise shows in the high quality Antarctic ice core record in comparison with the central-european temperature records (Fig. 4, blue curve). In summary, we trace back the temperature history of the last centuries to periodic (and thus “natural”) processes. This applies in particular to the temperature rise since 1880 which is officially claimed as proof of anthroprogenic global warming. The dominant period of 250 years is presently at its maximum, as is the 65 year period (the well-known Atlantic/Pacific decadal oscillations). Cooling as indicated in Fig. 2 can therefore be predicted for the near future, in complete agreement with the lack of temperature increase over the last 15 years. The future temperatures can be predicted to continue to decrease, based on the Fourier components. Finally we note that our analysis is compatible with the analysis of Harde who reports a CO2 climate sensitivity of 0.4 K per CO2 doubling by model calculations . Finally we note that our analysis is seamlessly compatible with the analysis of P. Frank in which the Atlantic/Pacific decadal oscillations are eliminated from the world temperature and the increase of the remaining slope after 1950 is ascribed to anthropogenic warming, resulting in a 0.4 deg temperature increase per CO2 doubling. The slope increase after 1950, turns out in our analysis as simply the shape of the 250 year sine wave. A comparable small climate sensitivity is also found by the model calculations  . “….if the six-driving-cycles do represent the climate then things are going to get cooler, quickly. Wait and see…” – the onset probably coinciding nicely with the release of AR5. The irony will be biting if all goes to (cycles) plan. Forget global warming – the Earth may soon be plunged into a 250-year cooling period, scientists have claimed. Russian climate experts believe that every 200 years the Sun’s activity temporarily wanes and it emits less heat. They believe this ‘cooling period’ could cause the earth’s average temperature to fall by several degrees. The last time this occurred was between 1650 and 1850 – a period known as the ‘Little Ice Age’. At the time, most of Britain’s rivers would freeze over during the bitter winters. Contemporary paintings show people could even cross the Thames using ice skates. The next ‘cooling period’ is scheduled to start between 2030 and 2040. But scientists from Pulkovo Observatory in St Petersburg think the cold period is unlikely to be as harsh as the last one. Researcher Yuri Nagovitsyn said: ‘Evidently, solar activity is on the decrease. ‘In this respect, we could be in for a cooling period that lasts 200 to 250 years. And Vladimir Kotlyakov, from the Russian Academy of Sciences, said: ‘There are no grounds to claim that global warming will continue till the end of this century. ‘Climate moves in natural cycles of warmer and colder, as well as drier and more humid times. ‘Early signs of cooling are already there and the trend may pick up in coming years. Lots of “could’s” and “may’s” for both warming and cooling scenarios. All about to be resolved conclusively very soon though – but not looking good for places like Britain if the past few winters are anything to go by. […] So could we be heading for another Little Ice Age? There are many uncertainties surrounding this question. Firstly, as explained in the previous answer, it is far from clear whether the Sun is headed for another period of calm. Recent research in the UK, predicts an 8% chance that we will return to Maunder minimum conditions over the next 40 years, based on past behaviour of the Sun over the last 9000 years. Secondly, there are still debates over the details of the Little Ice Age and the role played by the Maunder minimum. In Europe, there were considerably more cold winters in this interval, but they were not unrelentingly cold as they were in an ice age. Also, the Earth’s climate is evidently a highly complicated system, involving interconnected feedback systems, so it is difficult to disentangle causes and effects. For instance, several recent studies have suggested that solar-induced changes to the jet stream in the northern hemisphere may cause colder winters in Europe but this would be offset by milder winters in Greenland. Finally, even if the Sun were to head into a quiet period, others argue that the reduction in solar irradiance on Earth would still be small compared with the heating caused by man-made global warming. Mike Lockwood, a researcher at the University of Reading, estimates that the change in climate radiative forcing since the Maunder minimum is about one tenth of the change caused by man-made trace greenhouse gases. Read some modern history, Simon, before you make statements such as this one. Lysenko was a scientist who realised he could manipulate, to his own great personal advantage, the Soviet desire to crush religion coupled with the fact that Gregor Mendel, the father of modern genetics, was a Catholic priest. Other Soviet scientists of the day had to hide any grain crop trials that proved Mendel was right and as a consequence, millions of Soviet citizens starved to death due to the failure of food crops in a time when the Western world was producing huge grain surpluses. Your statement impugning the motives of sceptics is vile – ALL scientists should be sceptical. You are making faith-based statements that reflect badly on you and your faith, which have nothing to do with any form of actual science. I have to conclude that you are nothing more than a particularly nasty troll. Thanks for the reminder, Lisa. There’s a new post up now. 2012 cooler than 2002 in every respect – must be global cooling. Right beside that table is a NOAA graph of annual anomalies from 1950. It shows which years were affected by ENSO cycles. Three of those record years were caused by natural unpredictable climate fluctuations. What’s your point? From 2001, as you can see, there’s no rising trend. I’ve just seen RC’s graph at woodfortrees — exactly illustrates my point, thanks, RC. Again, it’s hard to know exactly what you’re telling us. The error margins of the temperature readings aren’t shown here, but they’re widely considered to be in the region of 2°C. That certainly reduces these “record” temperatures to intellectual curiosities, not worth the paper they’re scribbled on and not worth changing our lifestyles, taxation systems and industrial base, installing a world government or compensating stone-age cultures for our climate crimes. Because when you consider a margin of error of 2°C these so-called records, mate, vanish into thin air. Anyway, records that consist of excursions of half a tenth of one degree simply fail to impress. There’s also the matter of about four other global temperature teams. When you cast your eagle’s over them you don’t see so many recent records. Makes you wonder about the veracity of this dataset, for sure. One of the most common misunderstandings amongst climate change “skeptics” is the difference between short-term noise and long-term signal. This animation shows how the same temperature data (green) that is used to determine the long-term global surface air warming trend of 0.16°C per decade (red) can be used inappropriately to “cherrypick” short time periods that show a cooling trend simply because the endpoints are carefully chosen and the trend is dominated by short-term noise in the data (blue steps). Isn’t it strange how five periods of cooling can add up to a clear warming trend over the last 4 decades? Several factors can have a large impact on short-term temperatures, such as oceanic cycles like the El Niño Southern Oscillation (ENSO) or the 11-year solar cycle. These short-term cycles don’t have long-term effects on the Earth’s temperature, unlike the continuing upward trend caused by global warming from human greenhouse gas emissions. No, Rob, there’s no misunderstanding. You’re making a simple mistake. You’re imagining that we’re saying global warming has stopped and will never return. We’re — at least, I’m — not saying that. I’m saying very clearly that, during a stated period, there was no warming. That’s not cherry-picking or misleading in any way whatsoever. SkS also sets up another straw man — claiming that sceptics assert there’s been no warming for 40 years. Nobody says that, so they don’t need to refute it. We’re only talking about the last 20 years or so. That’s inescapable, as you can see that period of stasis on the “escalator” itself. 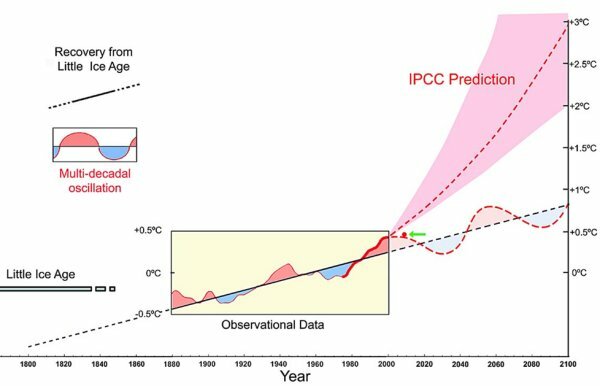 Now, although I don’t say global warming has finished (because I don’t know) I do point out that this period of stasis is getting so long it has become a problem for the models and their predictions. That’s the significance of the stasis — it casts strong doubt on the skill of the models, and therefore the predicted threats from man-made global warming. You can argue against that, but it wouldn’t harm your cause to acknowledge the truth of it. I guess it means one big problem for your side: the observed temperatures must catch up with the modelled temperatures fairly soon or they never will. An imaginary one at the moment. When do you expect the real one to show up again Rob? Yes, the negative phase of the 60 year climate cycle producing the current “standstill” and gazumping all other forcings including GHGs. But the 11-year solar cycle is a minor and negligible oscillation (despite its being held up as a “forcing” by NASA GISS for example) and even the short-term atmospheric response to an 11yr change is certainly not “large” compared to responses to quasi 200yr or 1000yr solar cycle changes. The 2008/9 11-yr cycle conditions did NOT produce Maunder Minimum conditions as the numb-skulls Schrijver CJ, Livingston WC, Woods TN, and Mewaldt RA (2011) assert – what were they thinking? The major solar forcing is the bicentennial component of TSI that, having been elevated at near 1000yr Grand Maximum level right up to 2011/12, is now beginning an accelerating decline. But atmospheric response to any solar change, short or long cycle, is lagged i.e. the instantaneous response is minimal and the response progresses over time starting at months, then years, then decades, then centuries with the most significant being just over a decade (and yes there are papers to cite). In other words, the atmospheric response to 21st century solar change, short or long cycle, has yet to be seen. When that response does eventuate, the acid test then goes on both scenarios. All the predictions from CO2-centric and solar-centric factions count for nothing when the observations come in. That is what there is to look forward to over the next 5 years or so. The Sun. The measured positive imbalance in 2005-2010 is particularly important because it occurred during the deepest solar minimum in the period of accurate solar monitoring (Fig. 2). “a forcing of ~0.25 W/m2”, “2005-2010 is particularly important” ? Really? Just because it happened in the satellite era? “Note that as our technique uses 22-year means of the solar modulation potential our approach cannot be tested with the last, unusual solar minimum in 2008. In order to reproduce the current minimum as shown in Fig. 1 we have adopted a value of 584 MeV for the future 22-year average in 2020 (which is 92% of the 22-year average for 1988–2009). Forget 2008/9. It is NOT “particularly important”. A reversal of “∼1W/m2 per decade for the period 1900–1950” IS particularly important on the other hand, if it eventuates in the near future. If you had the slightest inkling of statistics, gentlemen, you would understand that the long-term signal does not “go away” due to short term variation. Think of it as you walking the dog; whilst the dog makes many random excursions either side of your direction of travel, the overall direction is immutable and not controlled by the dog. I would have thought this was blindingly obvious, to all but the obviously blinded. the long-term signal does not “go away” due to short term variation. Precisely what I said, Taylor. You’re being deliberately obtuse. You’re simply avoiding the problem of the models’ lack of skill. I think he’s trying to say that it doesn’t matter that the climate models have been invalidated. The overall direction is immutable. Regardless of what the climate has been doing for the past two decades, the overall direction is immutable. Sounds to me like Rob’s belief system is the only thing that’s immutable. Here’s a thought Rob – the sensitivity of the climate to atmospheric CO2 has been overestimated and many other forcings and feedbacks come into play which our scientific community is only just beginning to quantify and hypothesize on. Far from the overall direction being immutable, we simply do not yet have enough information to make such an assured and arrogant conclusion. We are learning all the time. Science moves on, Rob, even if your belief system does not.